Time has value, whether it’s spent in the home or the factory. Saving time is the essential value of microwave technology. For the frazzled individual who craves a quick meal before scrolling through Tinder or binge watching Orange is the New Black, microwave’s benefits begin and end with time savings. For food processors, saving time is just the start. A smaller production footprint, higher throughput and greater yield also are potential benefits and are setting the stage for expanded applications for industrial microwave systems. Meatballs and other protein foods benefit from microwave preheating prior to conventional cooking, increasing throughput and lowering operating costs for food manufacturers. Bacon fixation has been a boon for the industrial microwave, which excels at crisping raw bacon. Pork processors are expanding their production capacity and replacing older microwave units, some of which have been in service for three decades. Microwave pasteurization also is growing, while microwave sterilization of shelf-stable foods is inching forward. “Tempering is by far the most popular application for microwave in food,” offers Mark Fitzgerald, COO of Ferrite Microwave Technologies, Nashua, N.H. Culling of domestic cattle herds in recent years is helping to expand use, as food companies turn to frozen beef imports. Waiting for a pallet of 60 lb. blocks of beef to thaw wreaks havoc with production schedules and waste rates. Microwave may be the best option to accelerate the process. Bacon may be a sweet spot, but pork and poultry often becomes rubbery when bombarded with 500-800 kW of power (home microwaves, by comparison, deliver 1 kW). Poor outcomes may have more to do with processor impatience than technical limitations, suggests Tim Scheurs, president of Applied Microwave Technologies, Cedar Rapids, Iowa. “Some products require a certain process time,” he notes, and extending the hold time instead of cooking chicken or pork as quickly as possible can resolve texture issues. As a temperature booster prior to an impingement oven, microwave is mining another opportunity, particularly with fully cooked, bone-in chicken. Conventional cooking either leaves blood spots near the bone or forces processors to overcook the exterior meat, points out Ron Mickey, vice president of Grandview, Mo.-based RMF Steel, resulting in loss of yield. Microwave energy at 915 MHz penetrates the meat to begin internal cooking, cutting cooking time as much as 50 percent. Microwave boosters will be “the next growth area” for industrial applications, Fitzgerald predicts. Boneless products like meatballs also benefit, with wave penetration heating the center to about 110° before conventional cooking. Product drying is another emerging application, particularly for spices and other ingredients requiring a dewatering process. A drying rule of thumb is that input of 1,200 btus is needed to remove 1 lb. of water, he says. With Ferrite’s microwave feed system, only 1,000 btus are required. 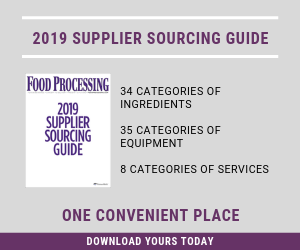 Microwave lines that string together multiple cavities have been used in niche applications in food production for decades, but that is beginning to change. Amtek exhibited a microwave unit-conventional oven combination with Unitherm at the recent International Production and Processing Expo in Atlanta. Lower capital cost, higher throughput and reduced operating costs are the pluses, according to Scheurs. Moisture removal from nuts is another successful application. One of the world’s leading manufacturers of magnetrons, applicators and other microwave components, Amtek has roots in the genesis of industrial microwave. Former managers of Amana, which commercialized Raytheon’s microwave technology in the mid-1960s, founded the firm. Ferrite ultimately acquired Amana’s intellectual property, while Amtek focused on component and equipment manufacturing. Microwave’s most intriguing application is food sterilization, and the first bona fide commercial success gives reason to believe the technology will play a bigger industry role in the coming years. Three groups are actively developing and refining microwave technology for sterilization. IMS, Harahan, La., has built a seven-year commercial track record. IMS scientists collaborated with counterparts at USDA and North Carolina State University to develop a continuous flow microwave thermal process that was validated by FDA to produce shelf-stable sweet potato puree. Approximately half of the nation’s sweet potato crop is produced in North Carolina. Three growers recognized the commercial potential in converting excess harvest and cosmetically marred tubers into a paste that could be stored unrefrigerated until sold. They named their enterprise Yamco LLC and began aseptic production in early 2008 in Snow Hill, N.C. Since then, Yamco has validated other low-acid products, including butternut squash, pumpkin, spinach, broccoli, carrot and peach. Packaging formats include 2,300-lb. totes, 450-lb. drums and 50-lb. bag-in-box. Two years ago, vodka distilling was added to the mix. Covington vodka is named for the predominant sweet potato variety in eastern North Carolina. “It’s taken awhile with Yamco, but they are on the uptick in being able to sell a distinctive product” sterilized in a single mode, cylindrical heating system, according to Bob Vorhof, IMS general manager. “The pioneers take all the arrows.” Yamco’s system is capable of processing particulate, though validating sterility remains a challenge, he adds. Microwave is extremely efficient at converting electric inputs into heat, but low-cost natural gas can work against conversion from conventional processing, Vorhof allows. Another variable is the dielectric properties of the food itself. But a second IMS system is being commissioned in Holland, and the technology will be on display this month in Cologne, Germany, at the Anuga Foodtec booth of Amtek partner Selo B.V. The IMS cylindrical system for microwave renders product commercially sterile and was the first industrial-scale microwave sterilization system in operation in North America. During the nine years a U.S. patent for the IMS technology was pending, some of the original inventors continued development work and founded Raleigh, N.C.-based Aseptia Technologies. Leading them was Josip Simunovic, a faculty researcher at NC State. Aseptia launched Wright Foods, a subsidiary providing contract manufacturing services in Troy, N.C. Two low-acid aseptic and two “ultra clean” hot-fill lines are running at Wright, with a pilot system on site. “You can’t price-compete with a can, but when people taste it, they’ll understand the value,” Druga says of the premium soups. Superior flavor and color retention are tough sells, so Dole relies on label claims such as no MSG or other preservatives, non-GMO and vegetarian to win trial. Unlike IMS’s vertical heater, Aseptia’s heater is aligned horizontally, with a larger process zone, he says. A modular design allows the unit to handle flow rates ranging from 2-40 gallons per minute without retooling. Up to 1.5 MW of energy can be imparted as food is heated from 100-180° C, with recipe management software controlling time and temperature. Mashed potatoes are Aseptia’s most viscous product to gain regulatory approval, and “theoretically, I think it would work” in sterilizing ground beef and other pumpable foods, Druga believes. For solids like salmon, technology under development since 1997 at Washington State University holds the most promise. Known as microwave assisted thermal sterilization (MATS), the system bombards products with a single-mode signal as they are conveyed through a series of pressurized cavities filled with water to achieve in-container sterilization. Progress has come in fits and starts, but proponents say it’s back on track. Like the IMS system and unlike multi-mode home microwave, MATS employs a single-mode cavity that accommodates the length of a single wave, resulting in homogenous energy distribution and a repeatable and predictable process. An 8-oz. pouch of chicken dumpling and sauce that requires 21 minutes in a conventional retort achieves commercial sterility in 6.5 minutes with MATS. Two batch machines are running trials at defense contractors Ameriqual and Wornik Foods, two major suppliers of meals ready to eat (MREs). Private industry and the Dept. of Defense have funneled millions of dollars into the development of MATS, most of it through Dual Use in Science and Technology (DUST), a public-private partnership that also nurtured high-pressure processing and other novel technologies. MREs are the successor to K-rations and C-rations, and while they provide more diversified eating, they are retorted products and often reviled. (A standing joke is MRE stands for meals rejected by everybody.) DoD’s Natick Soldier Research Development and Engineering Center has strongly backed MATS and helped place the pilot units (the Ohio Dept. of Development gave Wornick $1.7 million four years ago to install its test line). MATS’s tire-kicking phase may be drawing to a close. The first order for an industrial-scale, continuous processing machine has been placed with 915 Labs, according to Mike Locatis, CEO of the Denver-based firm. He expects delivery and commissioning to occur in 2016. Two additional orders are pending, and Australia’s Defence Science and Technology Organisation is studying the technology for possible use in troop feeding and emergency and humanitarian aid applications. The first full-scale line will output 150 packages per minute, Locatis says. Excitement surrounds new technology, and early enthusiasm can spark initiatives that in retrospect are premature. 915 Labs is the successor of Food Chain Safety, the original licensee of Washington State’s system. Both organizations were founded by Kevin Peterson, who also forged a partnership called MATSPack with Printpack Inc. to develop packaging compatible with microwave retort. Both Food Chain Safety and MATSPack now are defunct, though a Printpack spokeswoman says the firm continues developing MATS-compatible packaging. Trials on Ameriqual’s pilot unit were scheduled to open up to firms outside the DUST consortium last July, but Nestle, Hormel, Masterfoods and other consortium members have booked all the near-term available time, according to Ameriqual’s technical director. Rapid heat up and cool down is the key difference between microwave sterilization and conventional retort. A more benign process yields higher quality food, but the trick is selling it at a competitive price. That can require a different cost model, a surmountable challenge, as the more mainstream applications of microwave technology are demonstrating.